In Diagnostic Imaging Services, our radiology technologists are experienced and compassionate. We use state-of-the-art radiology equipment to make the patient experience safe and provide quality care. 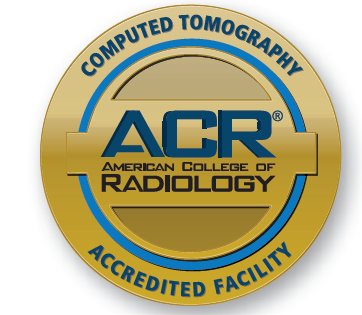 The Diagnostic Imaging department has been awarded a three-year term of accreditation in computed tomography (CT) as the result of a recent review by the American College of Radiology (ACR). General x-ray: An x-ray is a common imaging test that’s been used for decades. X-rays uses radiation to create images of the body. All of our x ray units are digital. Digital radiography is a form of x-ray imaging where digital sensors are used instead of traditional photographic film. Advantages include timer efficiency, and less radiation can be used to produce an image. Fluoroscopy: Fluoroscopy is an imaging technique that uses x-rays to obtain real-time images of the interior organs of the body while they are in motion. Fluoroscopy is used for many types of examinations such as barium x-ray tests, arthrography and placement of catheters. Digital mammography:The Digital mammography unit in our imaging department uses x-rays to produce detailed images of the breast. Digital mammography technology produces better images and has a higher sensitivity to identify abnormalities allowing for more precise diagnoses compared to conventional film screen technology. Dexa scans (bone density): A DEXA scan is a noninvasive procedure used to measure bone density. DEXA scans are the most accurate ways to diagnose the first stages of bone loss, the thinning of bones and Osteoporosis. Ultrasound: Ultrasound Imaging, also known as sonography, is the measure of echoes throughout the body in form of sound waves. These high frequency sound waves produce images of the body’s organs or the blood flow through veins and arteries. Ultrasound is used in pregnancy to monitor the fetal development and screen for any potential problems. Ultrasound is safe unlike conventional x rays. Ultrasound does not need to use radiation. Our new ultrasound unit allows for better image quality and can produce 3D images and color Doppler. Cat Scan (CT): Our new CT scanner is a Siemens 128-slice scanner which allows for improved image quality, speed and patient comfort compared to conventional CT scanners. Computed Tomography uses x-rays to take pictures of sections of the body. A CT scan shows the body’s organs more clearly and in greater detail than regular x-rays. Magnetic Resonance Imaging (MRI): Magnetic Resonance Imaging is a noninvasive test that uses magnetic waves to take two and three dimensional pictures of the inside of the body. A MRI scanner can look at body parts, organs and tissue from head to toe. We use a Siemens 1.5 Tesla MRI scanner in our Imaging department.